wrong pattern entered during verify pineapple. Recently, I have a cool weekend project to do at home. Kinda spending a good time with my gadgets. 😀 I decided to install Wifi Pineapple Mark 5 version 2.2.0 on TP-Link MR3020 version 1.9. Its a straight forward step and you can follow that tutorial on my personal wiki at wiki.khairulazam.net. 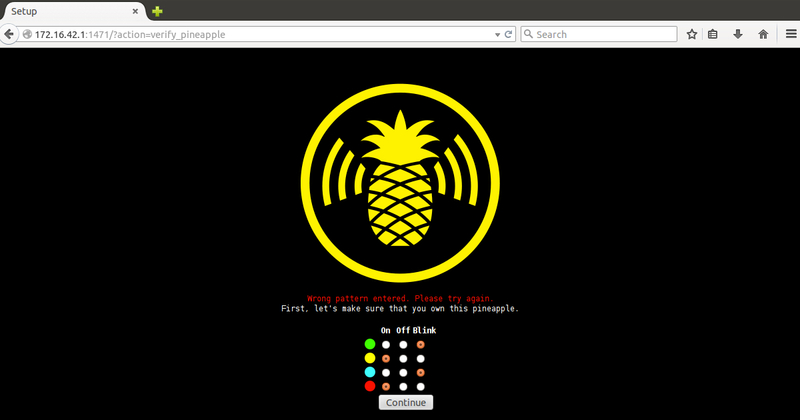 After the installation finished, you need to go through the pineapple security measure as a part of setting up pineapple for the first time. First, power off you device, which in my case, I’m using TP-Link MR3020. After that, unplug the USB pendrive that contain pineapple firmware and plug in it to your computer. I use Ubuntu Desktop to make this step easier. Go to line 199. Or search for keyword “array_search” in this “welcome.inc.php” file. Save this code. Unmount/eject your USB pendrive and plug in on your MR3020 back. After that, just power on your device, and try to go through the verify pattern step back again. At this time, it will accept any pattern you like. This entry was posted in hacking, installing and tagged openwrt, pineapple, tplink on 10/02/2015 by zam. you may have problem when trying to start sslstrip. This entry was posted in Uncategorized and tagged openwrt, pineapple, tplink on 11/01/2014 by zam.